I’ve subscribed to a Community Supported Agriculture (CSA) box for decades. Every week I pick up a box full of organic vegetables and from May through September I can also receive a bouquet of flowers grown on the farm (Full Belly Farm north of Sacramento). These gorgeous sunflowers were today’s bouquet. Arranging them in a vase at home, I thought of my sister Jayne’s wedding last weekend outside of Boise. I worked on flower arrangements for the wedding site with my sister-in-law Saren and my mother-in-law Jackie (it was a big family affair!) 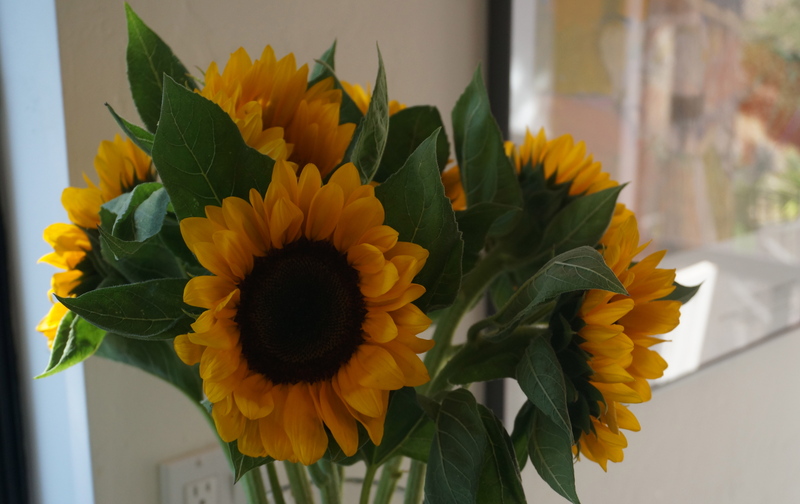 Jayne chose sunflowers as the dominant flower in the bouquets and provided several bunches from her local Costco. Alas, most of them were pretty droopy. After dealing with sunflowers from the farm over the years I knew that the woody stalks would need more than a quick trim to help them drink water. 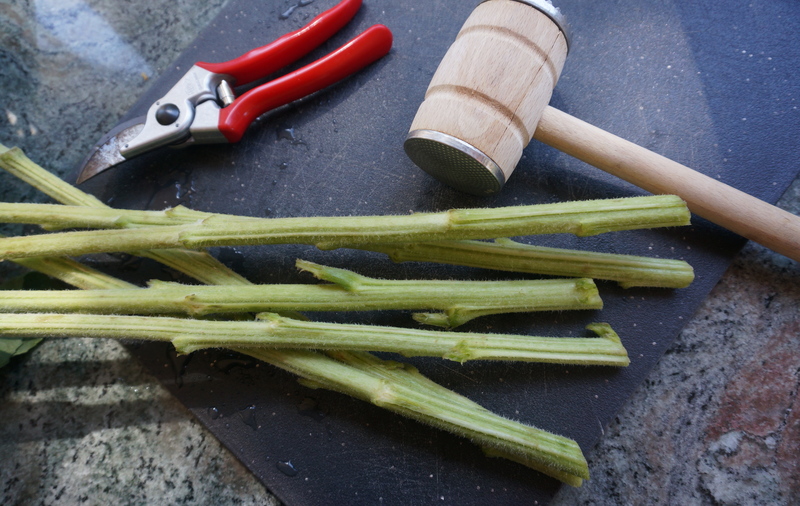 This was news to the rest of the family florists who looked aghast as I pounded the ends of the stalks with the handles of my clippers. But bludgeoning sunflower stalks really does help them take in water. It’s an easy, aggression-dispelling thing to try at home. 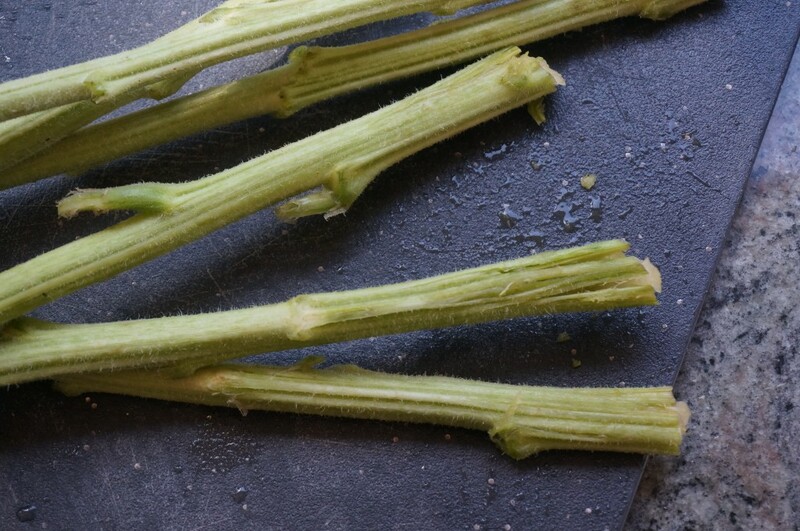 Cut the sunflowers to their desired length. Smash them with a blunt instrument. (My bludgeoning tool of choice is a little hammer or mallet.) 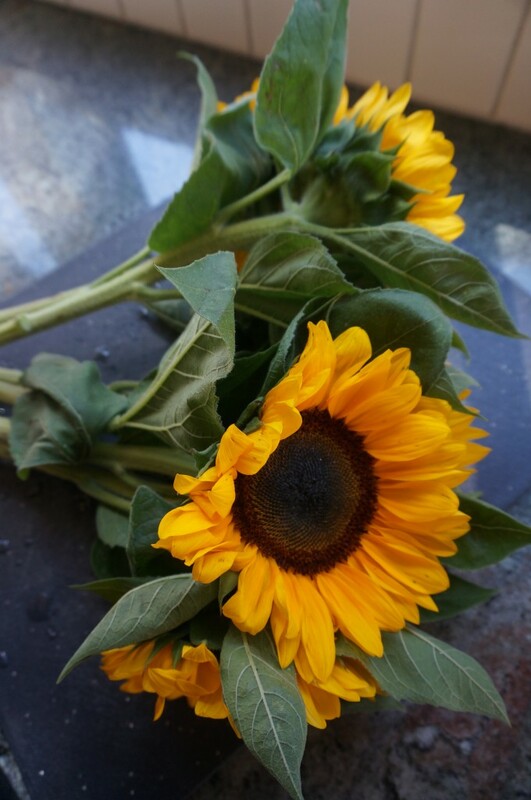 Your sunflowers should now be able to drink enough water to stay fresh for a week–though it’s still best to change the water and trim and smash the stems again mid-week. One man’s French pottery collection. West Elm’s VP of Furniture and Lighting Design shares his 5 Favorite Things. How a self-taught photographer staged a wedding and ended up as a pro. Carly Fiorni’s Look At This Face ad. What we can learn from doomsday predictions. Medieval students’ letters to their parents asking for money. This pretty video that has something to do with a seed. This entry was posted in Shelter, Spirit, Style and tagged design, doomsday, flowers, letters, photography, politics, sunflowers. Bookmark the permalink. Post a comment or leave a trackback: Trackback URL.